Bangalore is synonymous to movement, pace and progress. Office hours are crazy and weekends are spent in pubs, drinking away deadline and presentation worries. If you want to try something a little different for a change, we suggest you head to Cubbon Park during sunset for detoxification that no amount of alcohol can offer. Rest on your eyes on the abundant green and enjoy some quiet time in this haven of solitude and tranquillity. It is because of Cubbon Park that Bengaluru gets the euphemism of Garden City and rightly so! From a rich variety of flora and fauna to impressive buildings and even a bandstand that hosts shows, Cubbon Park is your first step to rediscovering your city as a tourist! 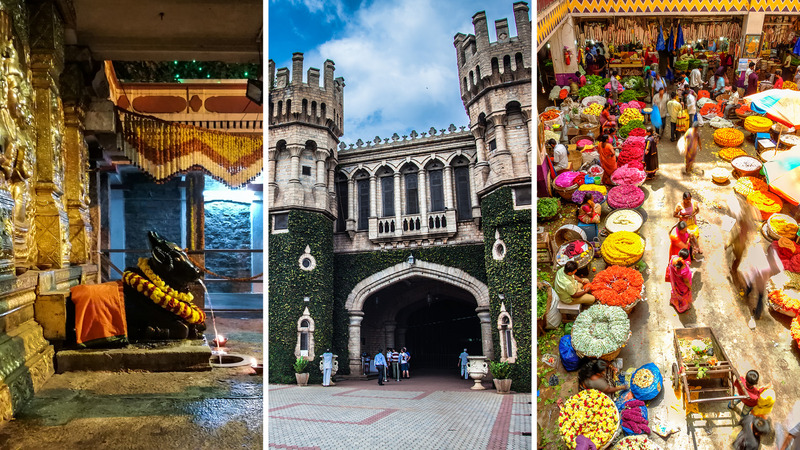 Currently owned by the Mysore royal family, Bangalore palace has seen its share of residents and years of magnificence and glory, which still remain. The brilliant construction and painstaking attention to details are put on display on every wall and pillar. The palace gates were thrown open to visitors in 2005 and are now a site of important cultural events. The palace has witnessed Iron Maiden, Elton John, and Akon perform, among many more. “There's a sunrise and a sunset every single day, and they're absolutely free…"
Lal Bagh is no ordinary botanical garden. It has its roots and its past steeped in royal history and was first designed to be a private garden by Tipu Sultan’s father, Hyder Ali. It is for Lal Bagh’s scientific advancement, meticulous maintenance, and abundant flora and fauna that it has gained the recognition of being one of the most beautiful parks in the eastern part of the world. The garden has manicured and well laid-out streets that take you around and is a great assistant to the botanical studies of the country. You may have heard from your visiting friends or tourists about Bannerghatta National Park but never ended up spending some time there. Who would’ve thought that in the proximity of the IT hub of India is the country’s first ever butterfly park! The safari rides inside the park come with the chance of spotting the big cats! What are the odds! Built as long back as 1537 by Kempegowda with just mud bricks, the legendary ruler Tipu Sultan’s summer palace is worth witnessing at least once. The construction of the fort was completed by the ruler himself in 1791 and it now stands as a testimony of the artistic and architectural prowess that prevailed back then. The stunning mix of Hindu and Islamic style in the construction is evidence of the ruler’s religious tolerance. You can find further genuine stories about the fort and the ruler in the fort’s art gallery. You may have your hangout spot where you go routinely with your friends, but there’s no way you can miss out on Brigade Road, one of the hippest and happening streets in Bengaluru. Indulge in extravagant shopping, go pub-crawling, and stroll on the wonderfully-lit Brigade Road, and you’ll know that this is the heart of the city as far as the youth is concerned.